The Nigeria Under-20 national team will secure their passage to this year’s Fifa World Cup finals with a win over highly-rated Congo in their penultimate group game of the African Youth Championship on Wednesday. The Flying Eagles are top of Group A standings after their opening win over hosts Senegal, ahead of Cote d’Ivoire, who drew 1-1 with the Congolese in the other Match Day 1 fixture on Sunday. Congo are the black horse of the 2015 African U-20 Championship having eliminated defending champions Egypt in the qualification rounds on away goals rules. The Young Red Devils won 2-0 in the home leg and lost 2-1 in Cairo to secure a 3-2 aggregate win. Flying Eagles are Drawn Along With Senegal, Cote d’Ivoire and Congo in Group A of the AYC. Image: LMC. The 2007 winners- at the expense of their Nigerian counterpart- also eliminated Niger and Benin Republic (both via shootouts) on their track to Dakar. “They have a very organised defense and they are a very physical side,” assistant coach of the Eagles Nduka Ugbade, who watched Congo draw with Ivory Coast in the company of his charges, is quoted as saying on theNFF.com. 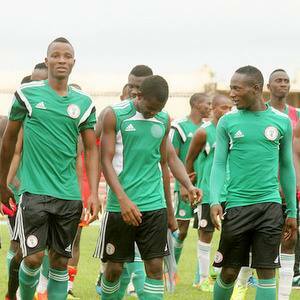 The Nigeria U-20 are not nursing any injury concern ahead of tomorrow crucial encounter. All 21-players in the squad took part in full training on Tuesday morning at the Stade Iba Mar Diop in Dakar. Congo will be boosted by the return of star players Raphael Ebera and Constantin Bakaki for the Nigeria game having served the last game of their suspensions from the qualification rounds on Sunday. The pair, alongside Kader Georges Bidimbou and Hardy Binguila, have featured at full international level for their country. Head coach of the Congolese U-20, Paolo Berretini, hopes his side will improve on their laboured first-half showing against Cote d’Ivoire when they pit their wits against six-time champions Nigeria. “We watched Nigeria (vs Senegal), they are a very good team but we will take them on with confidence,” the Italian coach said. The Flying Eagles are a win away from booking their ticket for the 2015 Fifa U-20 World Cup, thanks to Congo draw with Ivory Coast in the second Group A game on Sunday. Both Ivory Coast and Congo have a point apiece in second and third place respectively, while Senegal are bottom of the table. A win for Nigeria against Berrettini’s side on Wednesday takes the leaders’ tally to six points, leaving only Cote’d’Ivoire in position to better that tally- only if the Young Elephants win their remaining two rounds of matches (including a final group game against the Eagles). Inasmuch as such prospect, Nigeria will progress as runners-up. Senegal, who suffered a 3-1 defeat at the hands of Nigeria on Match Day 1, have a slim chance but must also win their remaining two matches, which place them on equal footing (on points) with Manu Garba’s side. The hosts must also make up for their inferior (-2) Goal Drawn tally. Anything short of a Nigeria win over Congo renders this permutation invalid. All four semi-finalists of the 2015 African Youth Championship advances into the group stages of the Fifa U-20 World Cup later this year. Lewandowski to Sign Bayern Pre-Contract in January.